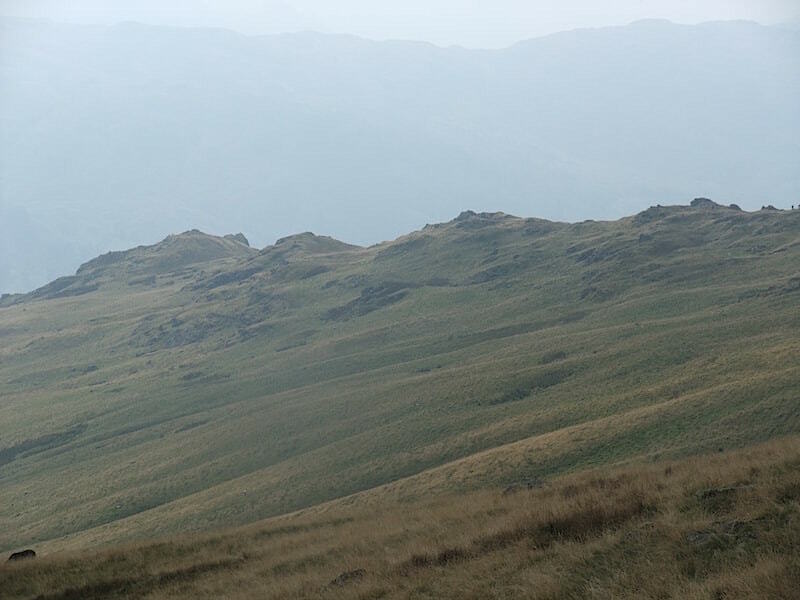 Seat Sandal from the lay-by at Grasmere in warm but hazy conditions. We’re heading up to Alcock Tarn to begin with but first there’s the tricky problem of crossing the busy A591. 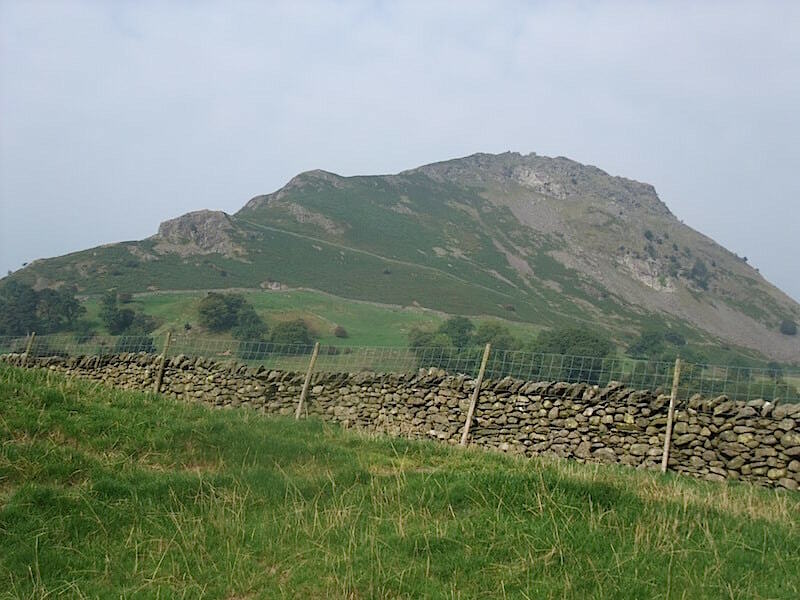 Helm Crag from the lay-by. Safely across the road and a look at the poor visibility, even over Steel Fell which you could practically reach out and touch from here. 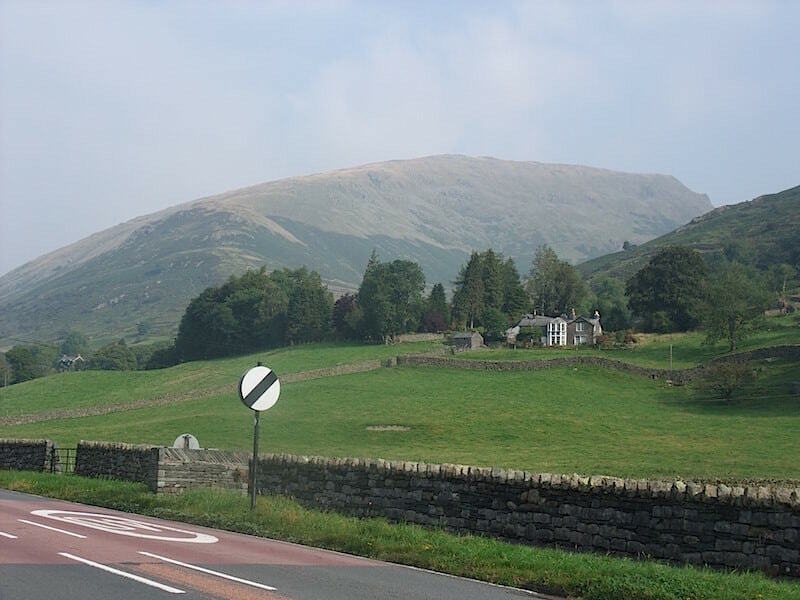 From the A591 we take the small lane close to the Swan Hotel at Grasmere. About halfway along the lane we turn up a smaller, steeper lane which ends at a gate in this wall. We go through the gate and immediately turn right which brings us to this bridge. A turn to the right before the gate would see you walking through that gate behind the wall and straight into someone’s front garden. 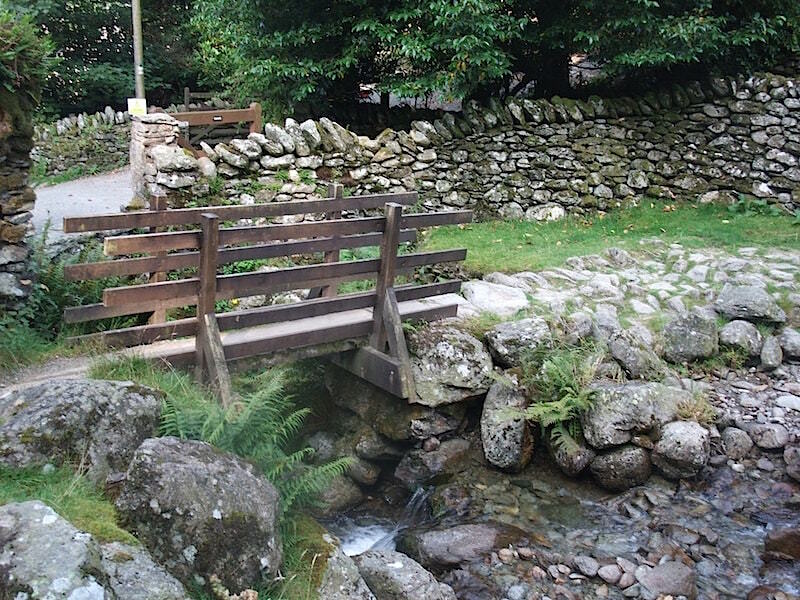 We cross the bridge for the path to Alcock Tarn. Looking up the beck from the bridge. 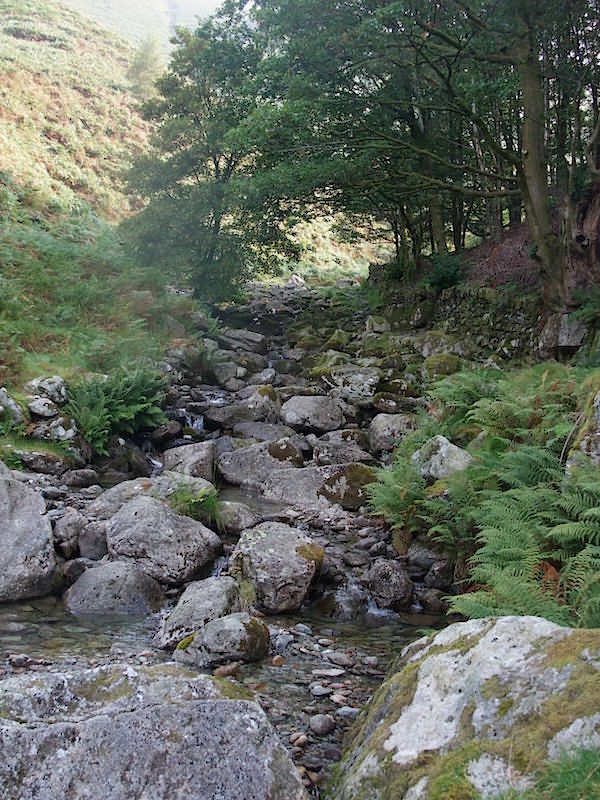 The path more or less follows the route of the beck for a while before turning away from it and crossing the fell side. From the path a view of the aqueduct carrying water south, over Greenhead Gill, from Thirlmere to Manchester. 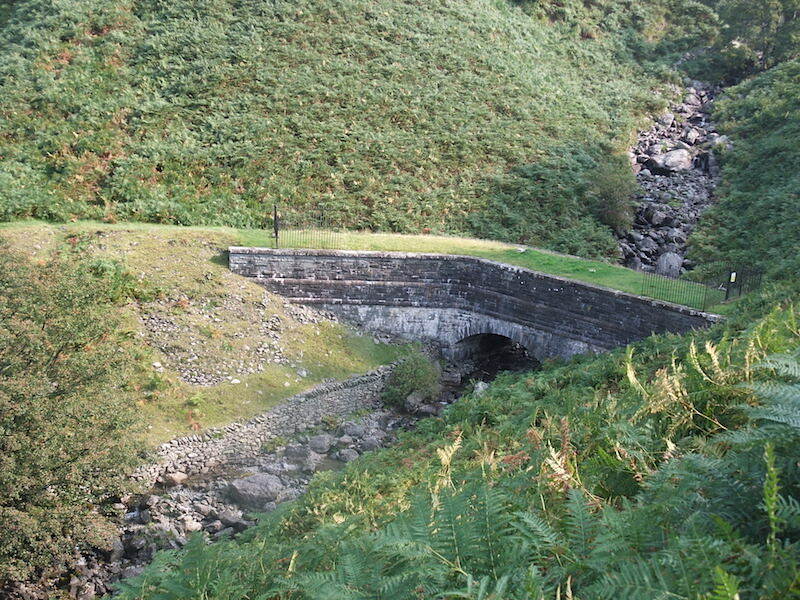 There’s probably more water in the aqueduct than there is in the gill at the moment. 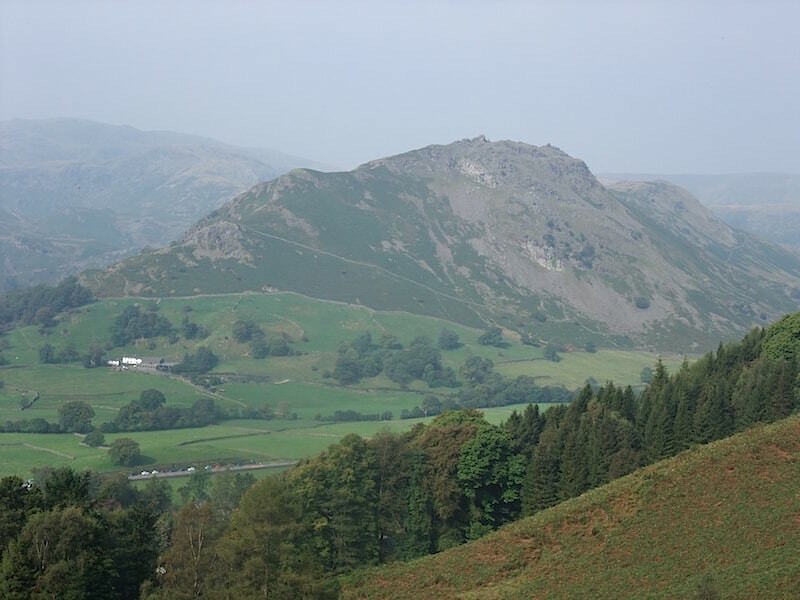 Looking across to Helm Crag, the visibility still poor. 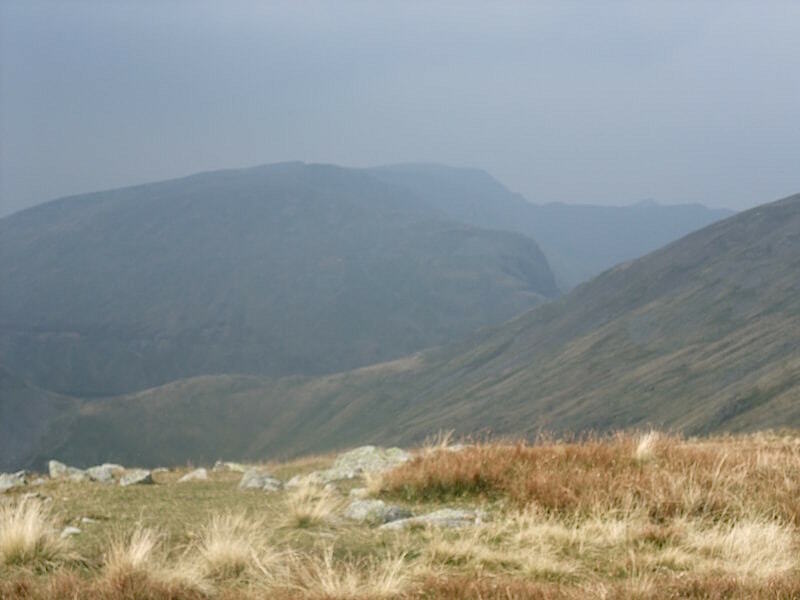 Looking across to Stone Arthur from the path to Alcock Tarn. Alcock Tarn. 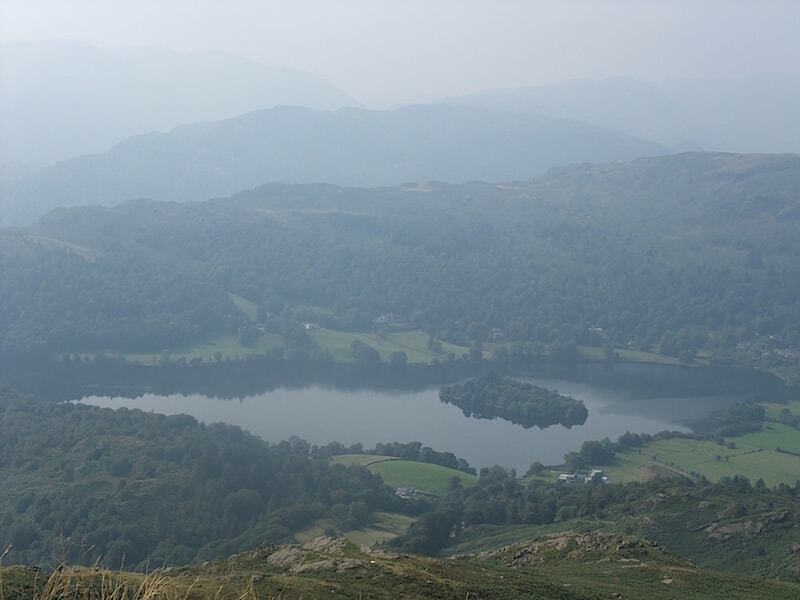 It was originally a natural tarn and called Butter Crags Tarn. In the late 19th century one Mr Alcock, who lived in the Hollins further down the hill, enlarged and damned the tarn to create a trout lake. 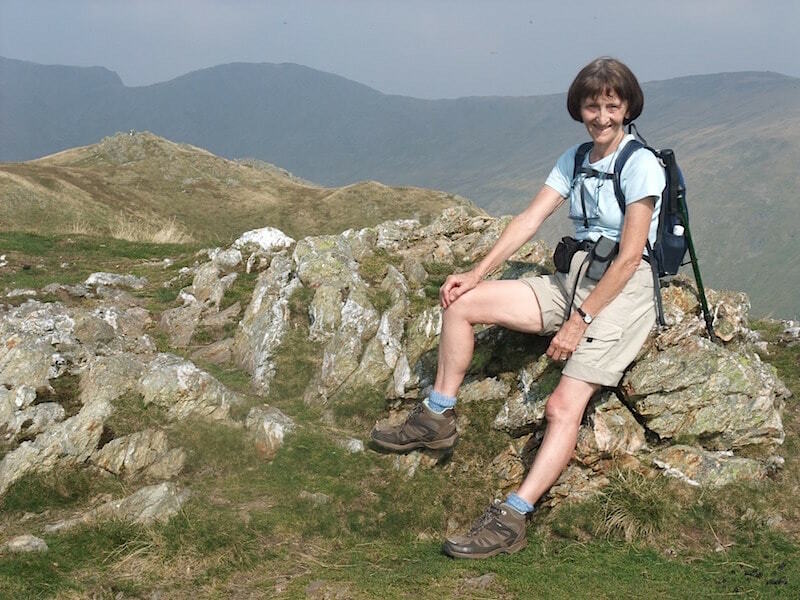 Hollins is now the regional office for National Trust. Below us Grasmere is just about visible. 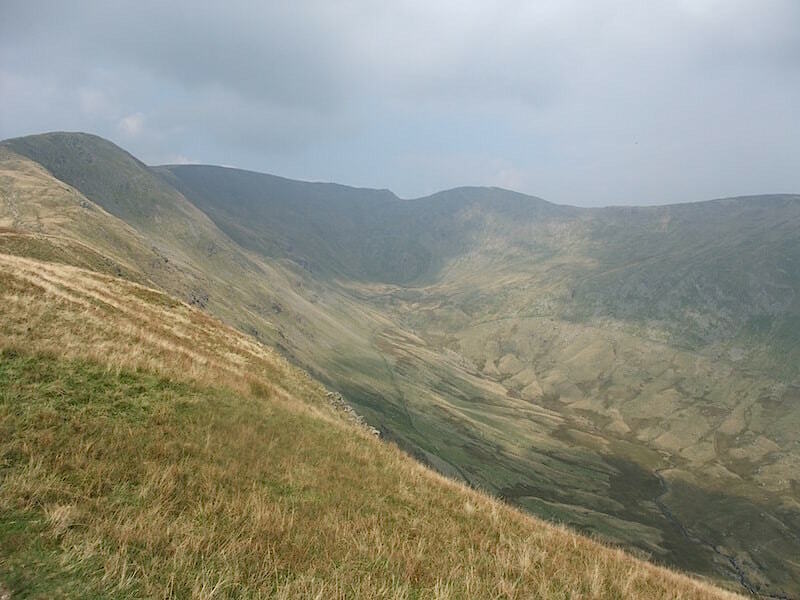 From the tarn we locate the path which will take us across the fell side over to Nab Scar. 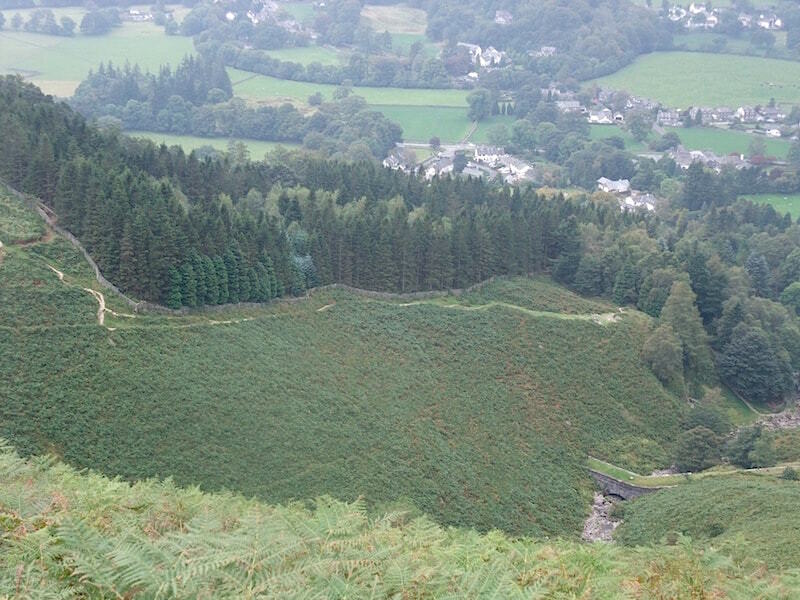 Its much easier to find now that the bracken is dying back. 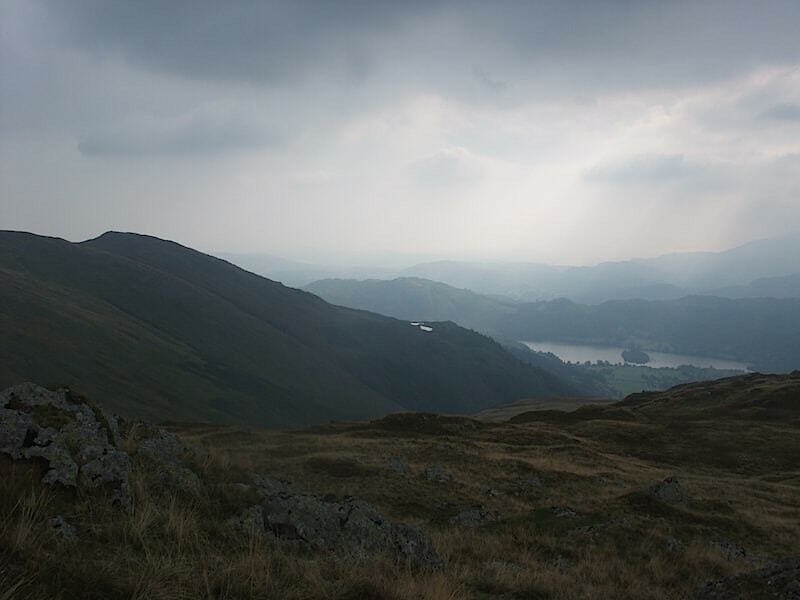 Grasmere again, its a shame that conditions aren’t a little bit better. 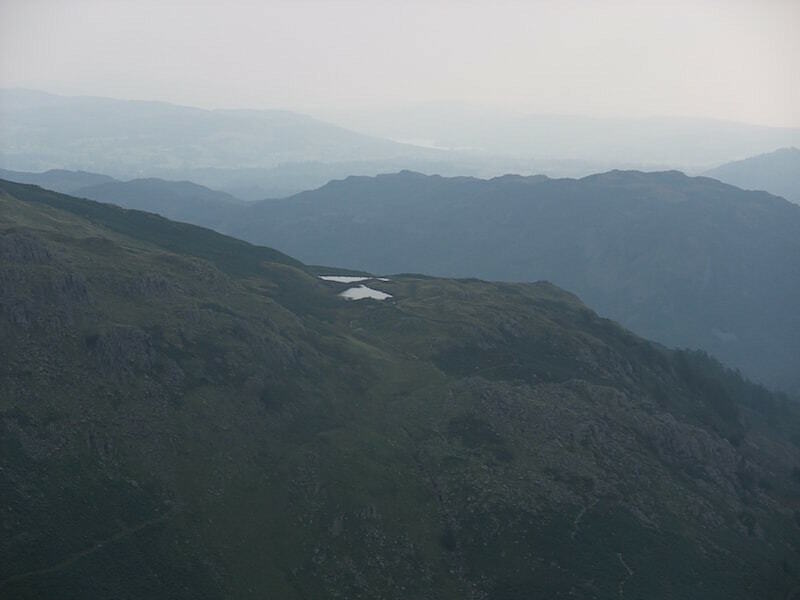 Looking down at a dried up Dockey Tarn, that’s the white area to the bottom left just below the bracken. 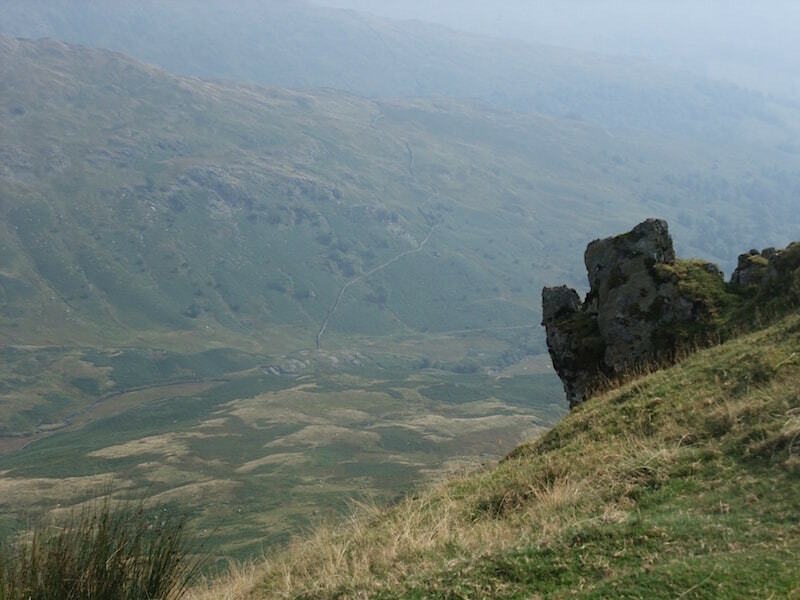 Looking ahead to Heron Pike from Nab Scar. 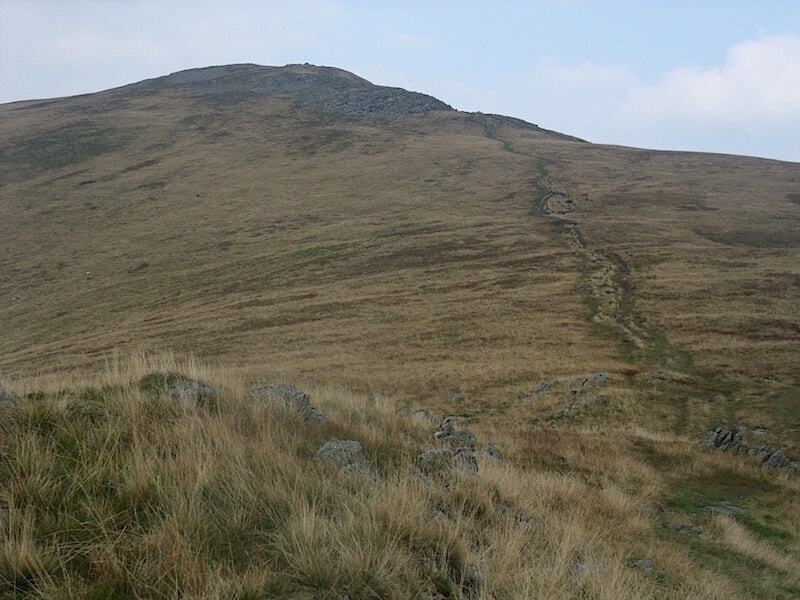 From Nab Scar we take the ridge path over to Heron Pike. 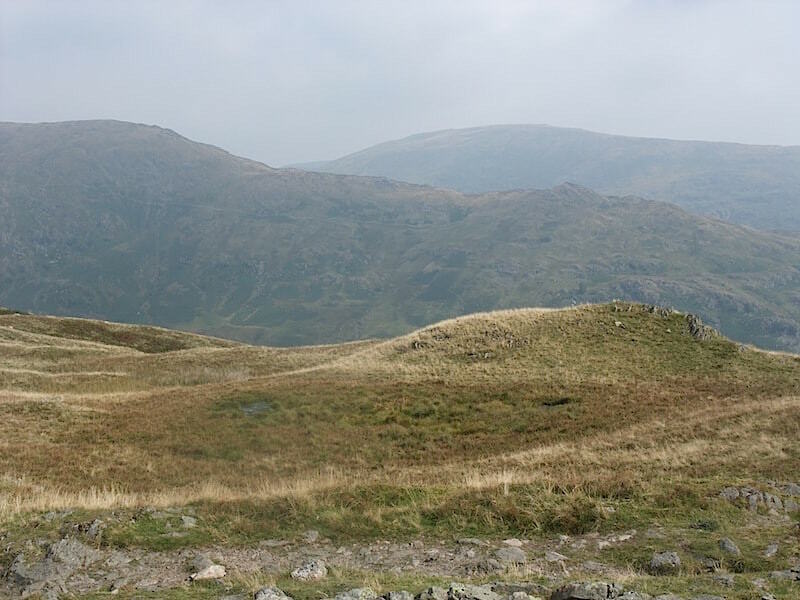 Crossing the ridge and over on our right we have High Pike and Low Pike in the centre with Red Screes beyond. 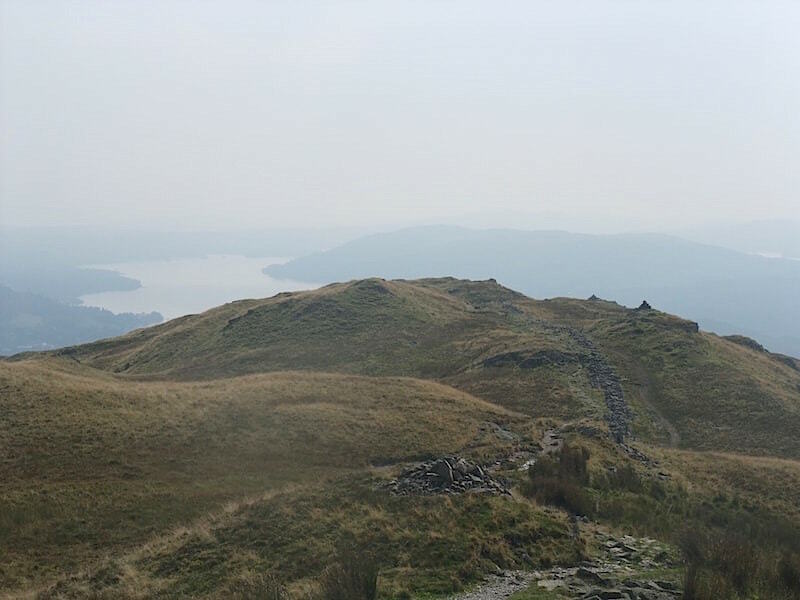 A bit further on and I take a look back at Windermere and Nab Scar again, the haze is getting worse. 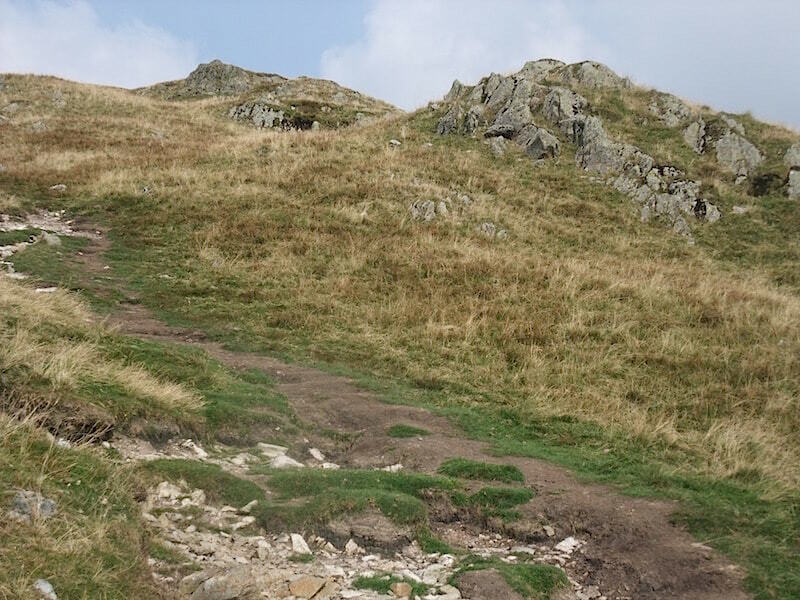 Outcrops en route to Heron Pike. Every walker coming towards us warned us of the swarms of insects which were up ahead, not something to look forward to then. 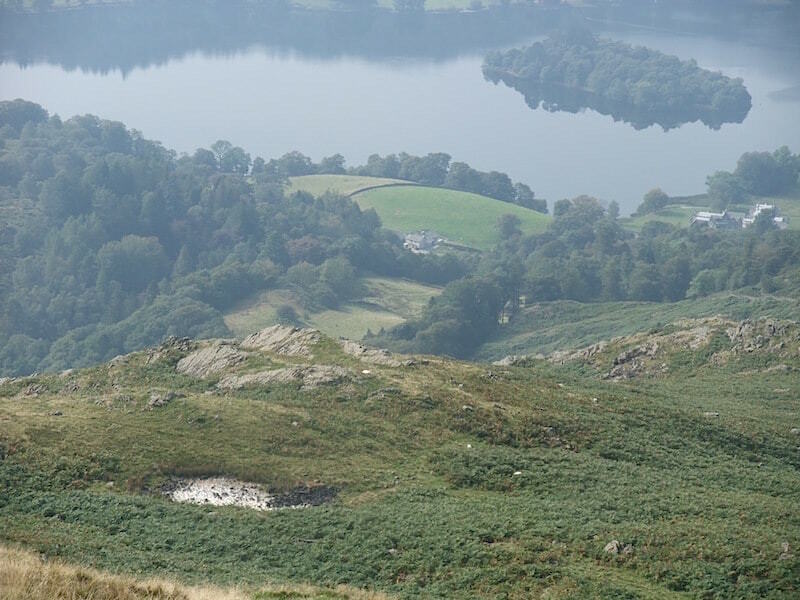 A look down into the Rydal valley from Heron Pike. From Heron Pike the view across to Great Rigg on the left, Fairfield in the centre, and Hart Crag over on the right. 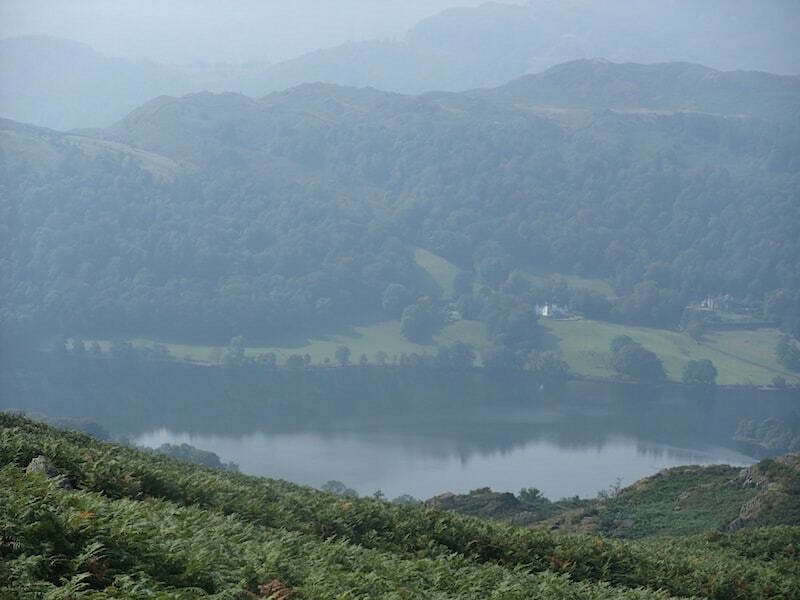 What we’re looking at is the head of the Fairfield Horseshoe. 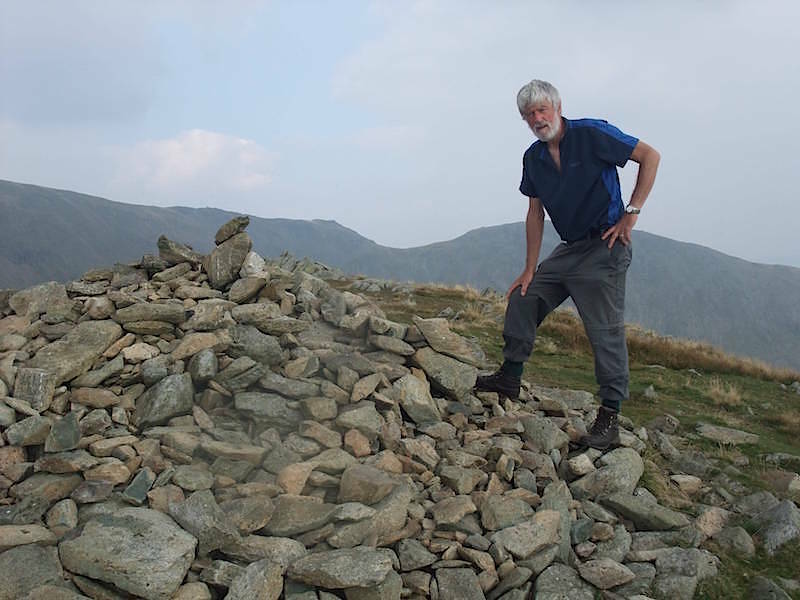 On Heron Pike but as Wainwright said “Heron Pike is neither a pike nor will you find herons there”. 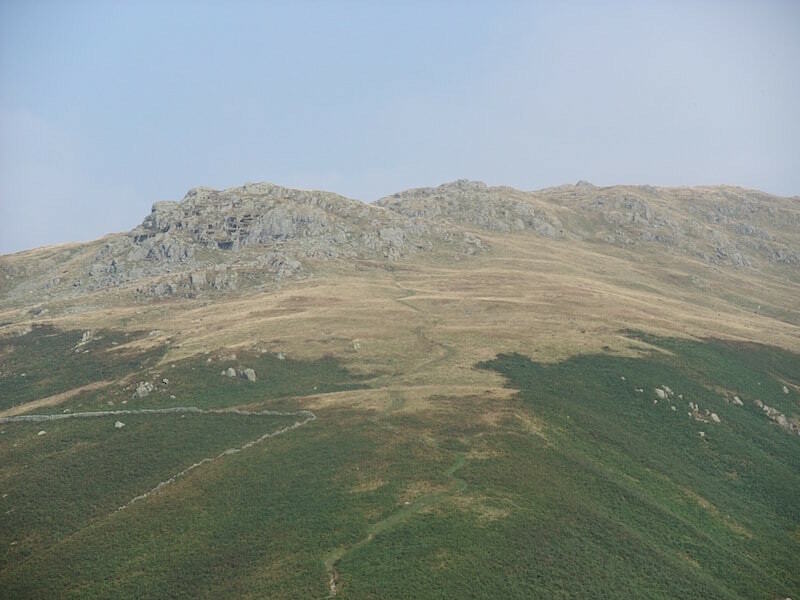 On the skyline is Fairfield on the left and Hart Crag to the right. 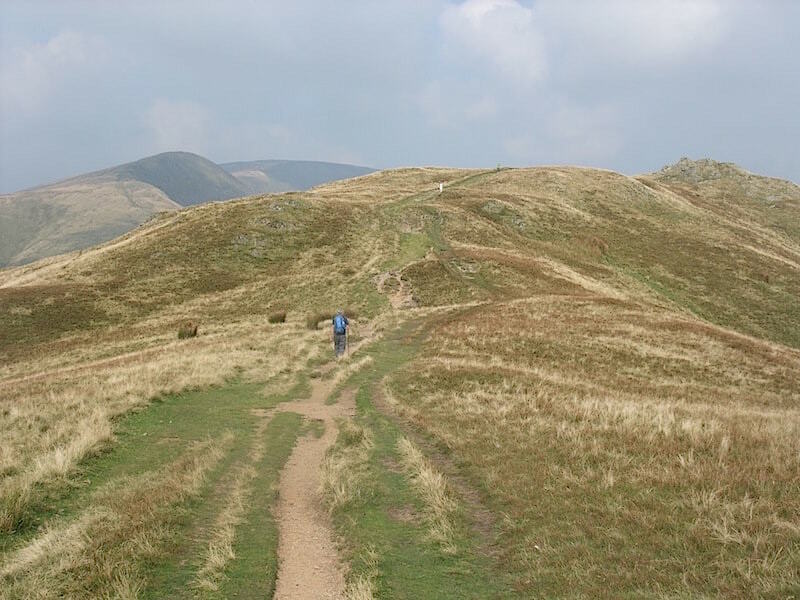 Moving on towards Great Rigg on the left horizon. 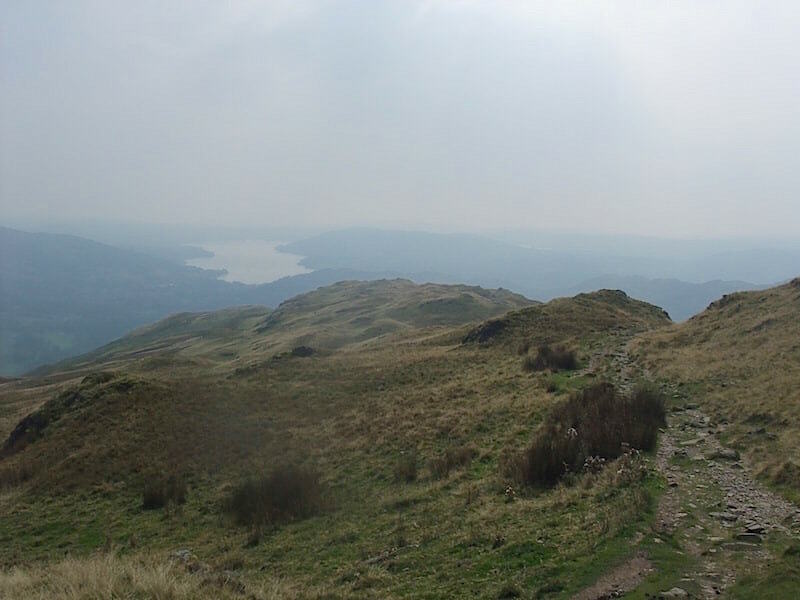 Windermere is only just visible now as the haze gets thicker. Passing by an un-named tarn along the Heron Pike ridge. 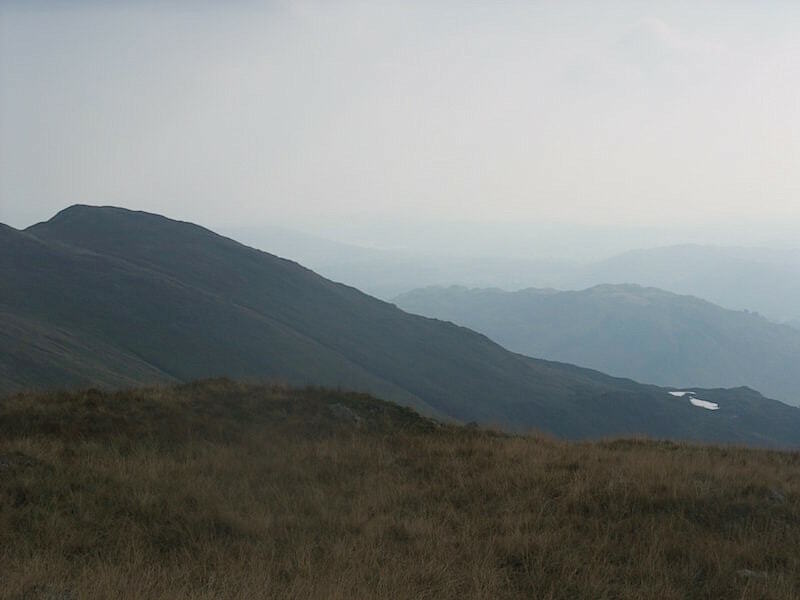 Looking over towards the head of Rydal valley as we make our way to Great Rigg. Looking across at Stone Arthur, which is over on our left. 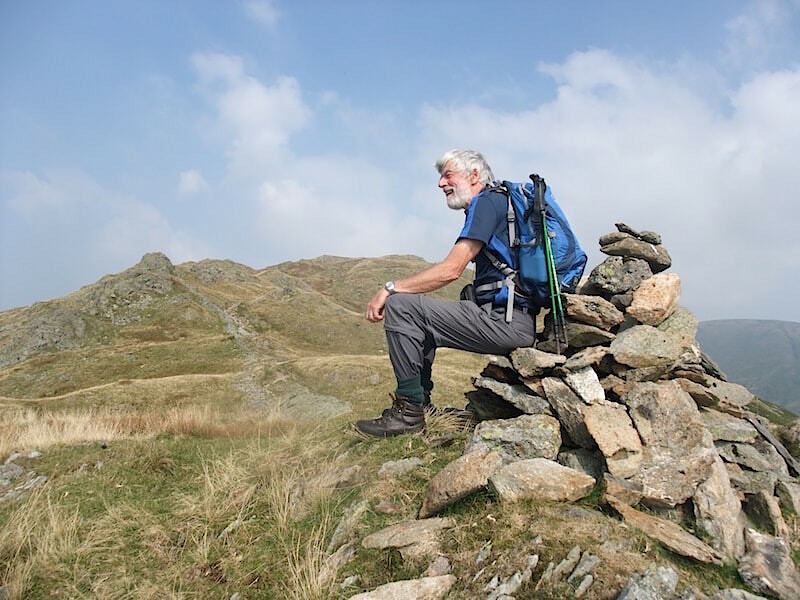 On Great Rigg looking across to Fairfield, with clouds of flies everywhere. 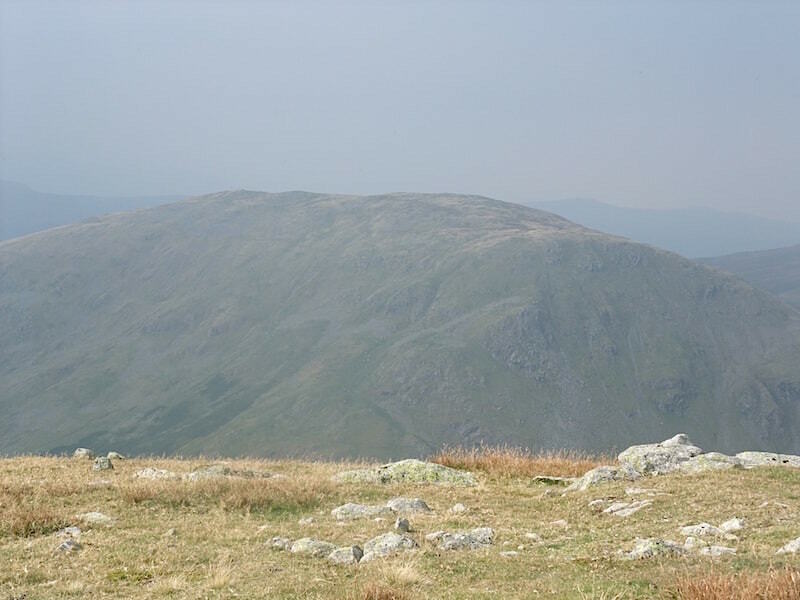 Its difficult to pick out any features on Dollywaggon Pike in the centre, and Helvellyn is just about visible behind. 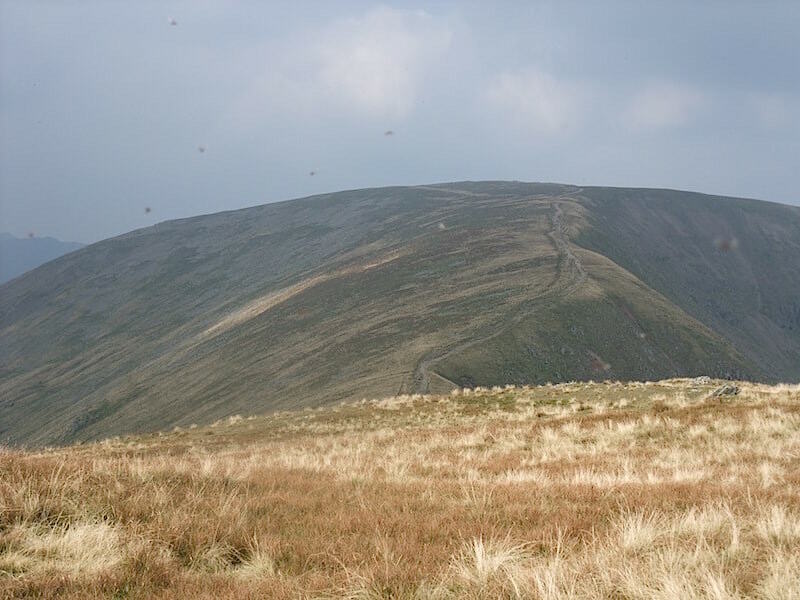 Just after I took this photo I was approached by a lady who asked me if we were standing on Dollywaggon Pike. 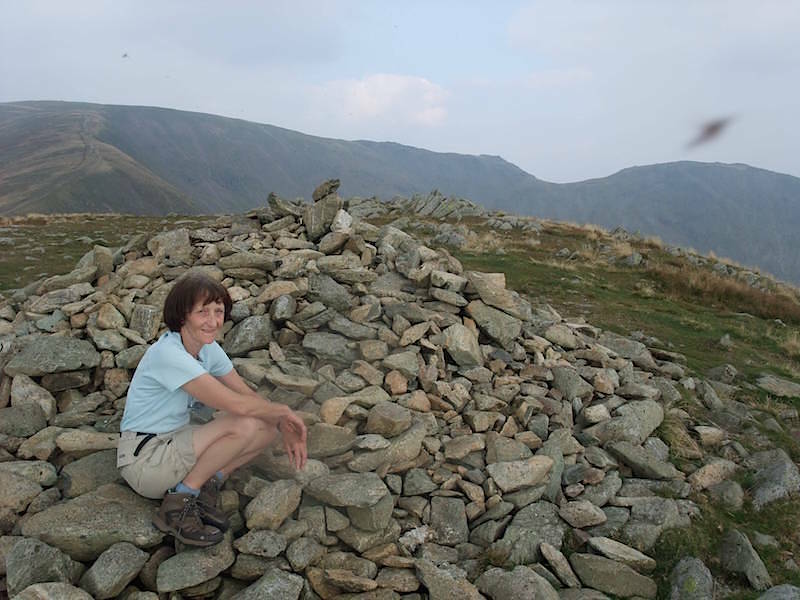 I had to tell her that we were on Great Rigg and pointed out where Dollywaggon was. 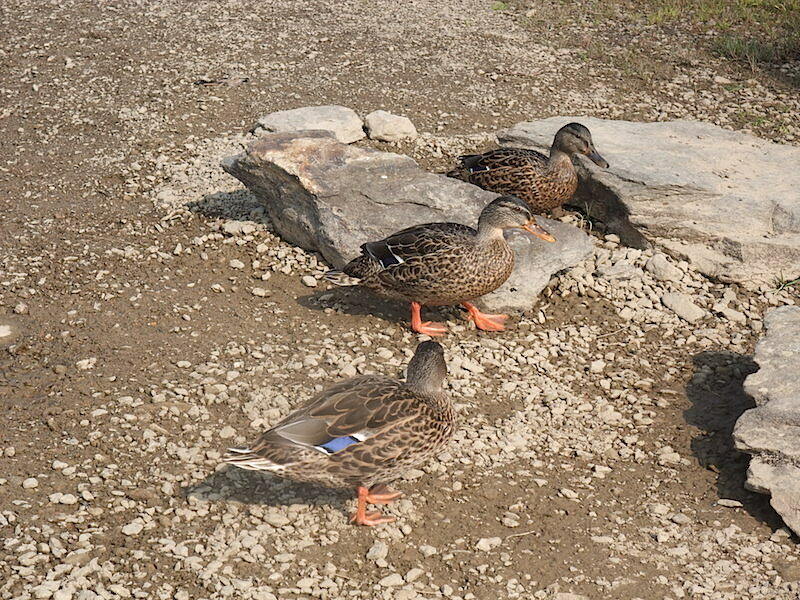 I wasn’t party to the conversation she had when she returned to her companions, whom I suspect were husband and teenage children, but I imagine it might have been rather heated. 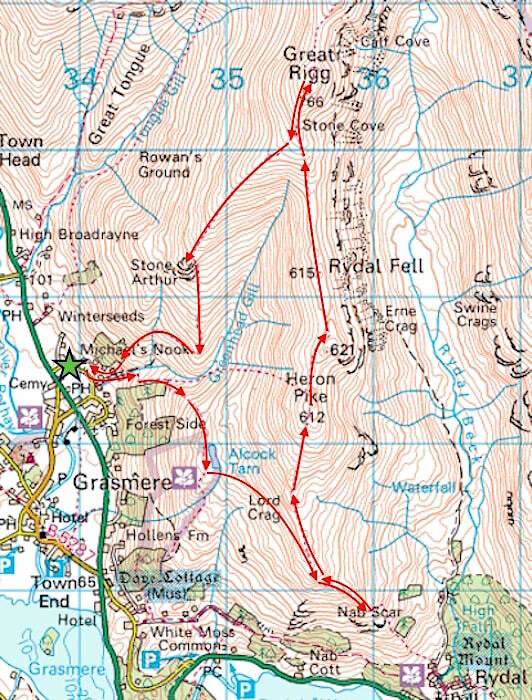 Husband, who was presumably group leader, was standing some way away and concentrating on a map, teenage children standing around looking as if it was the last place on earth they wanted to be, and Mum is returning with information that Dad probably doesn’t want to hear. Ah well, its not the first time we’ve witnessed such a situation and it definitely won’t be the last. 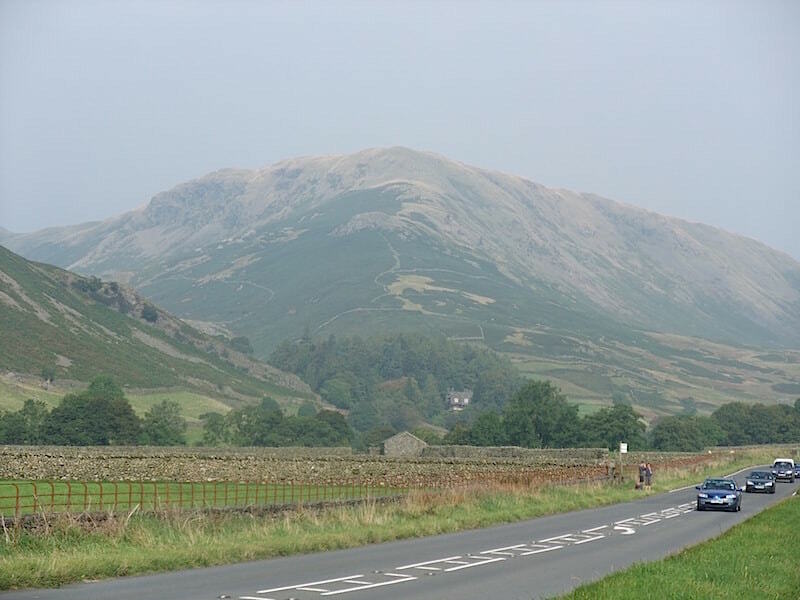 A hazy view of Seat Sandal. 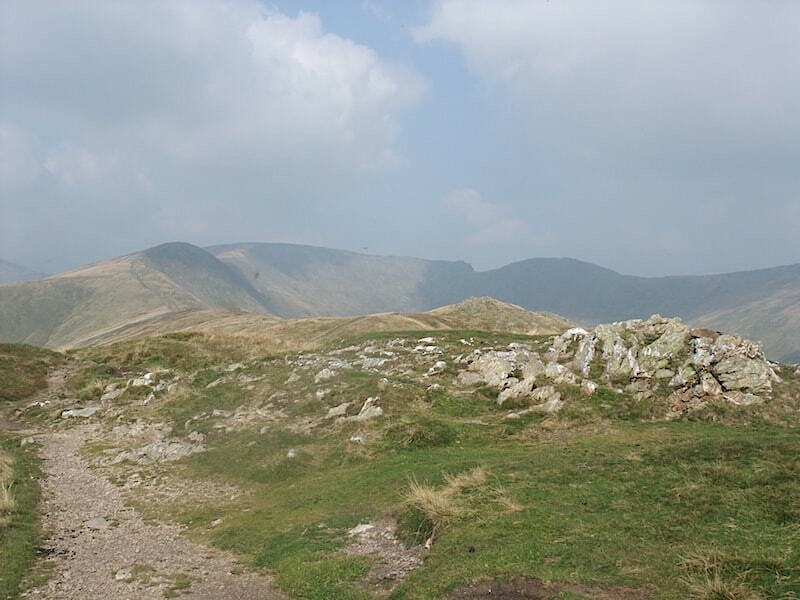 Great Rigg summit with part of Fairfield on the left, Hart Crag on the right, and flies everywhere. 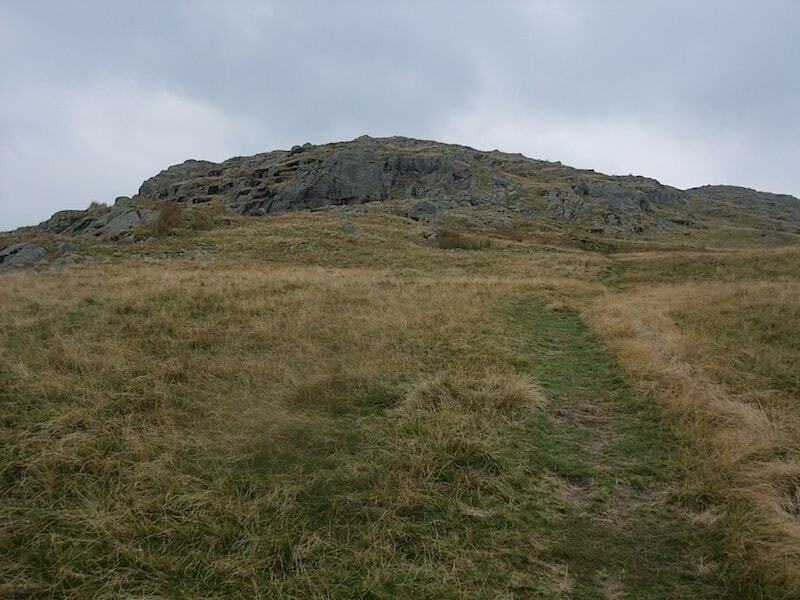 Great Rigg’s great big summit cairn. 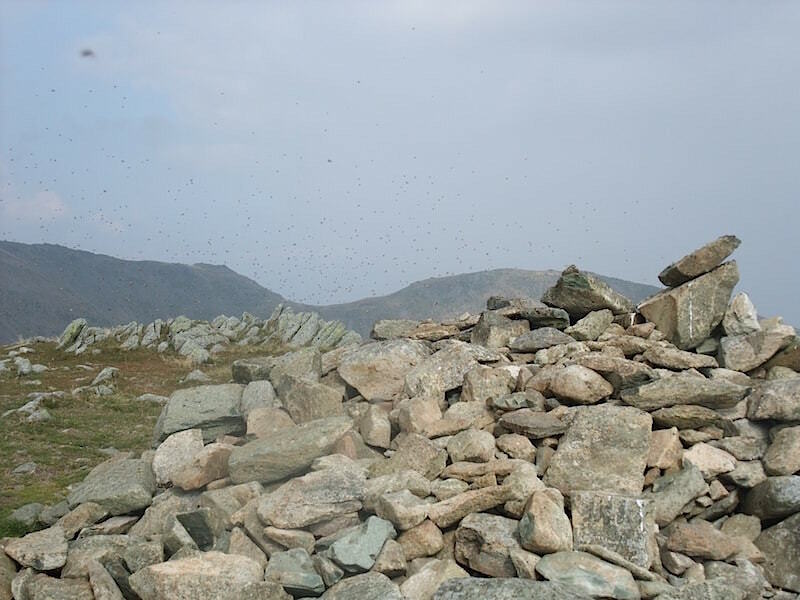 The black blob on the right is not a UFO, just one of the flies which were out in great numbers on Great Rigg summit. 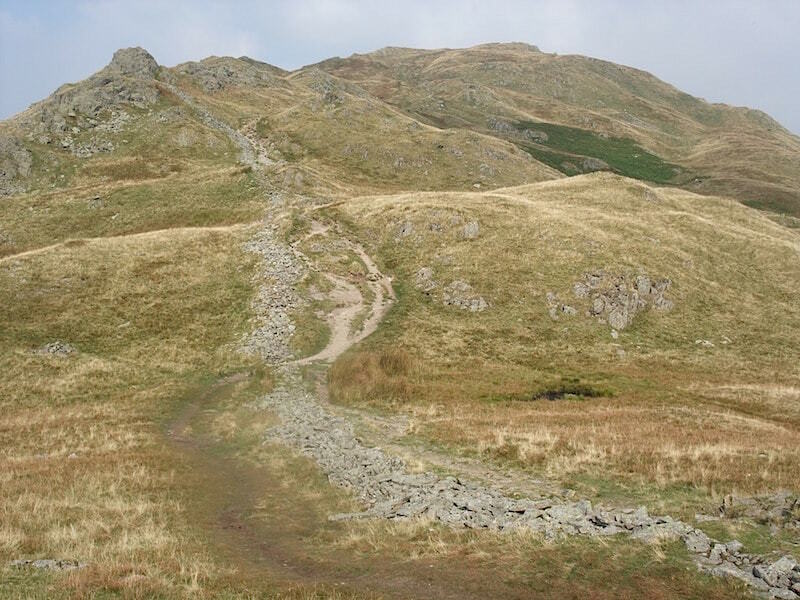 Looking back at Great Rigg on the way to Stone Arthur. The swarm of insects up there became too much to deal with and we didn’t linger. As we walked down we met a lone walker coming up who stopped to mop his sweating brow and had a chat with us. 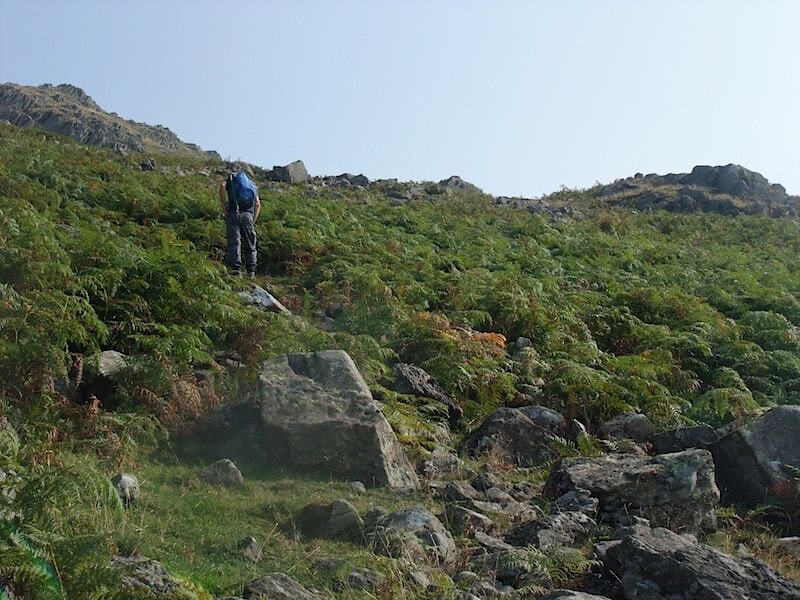 We learned that he had just driven all the way up from Oxfordshire, dumped his bags in his lodgings immediately on arrival, grabbed his rucksack and started walking up here, now that’s a keen walker. The haze is now much worse and hardly any detail can be seen. 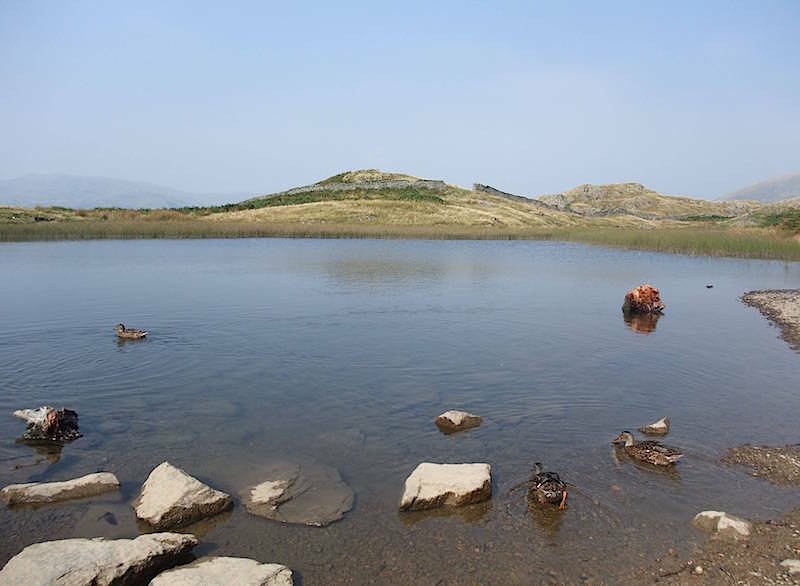 Heron Pike and Alcock Tarn are still showing though. 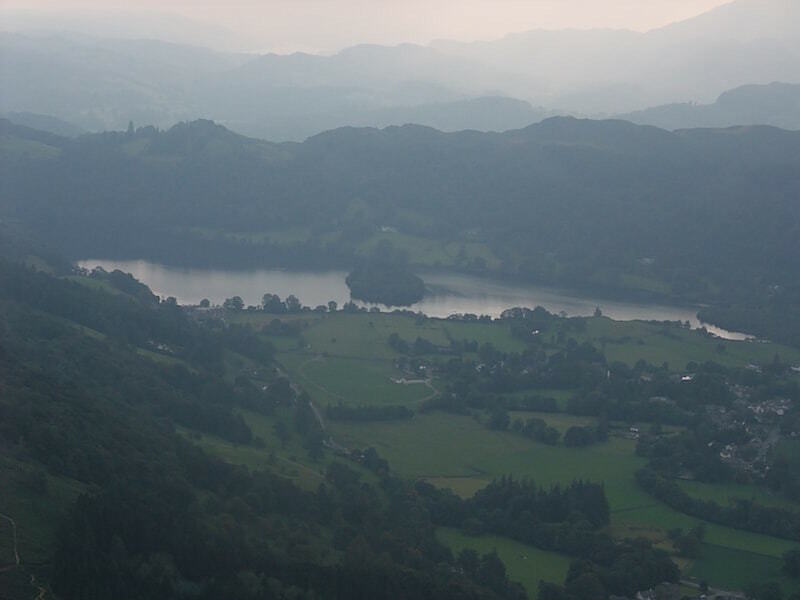 Looking down at Grasmere with Stone Arthur on the right. The light now has a strange pink tinge to it. Heading across to Stone Arthur. 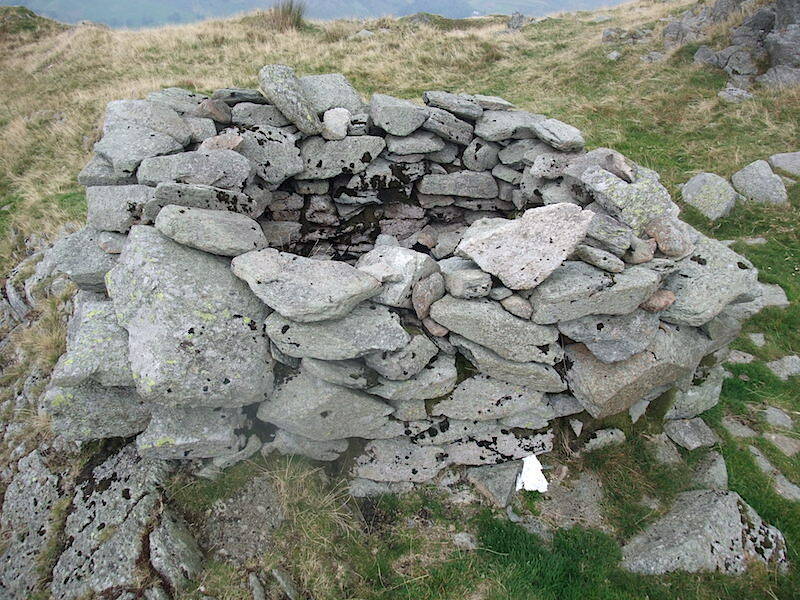 Heron Pike, Alcock Tarn and Grasmere, and that’s just about all there was to see..
We couldn’t decide what to make of this, the only way in was through the top, and if it was an animal trap it would be easy to get out of as it wasn’t very deep. 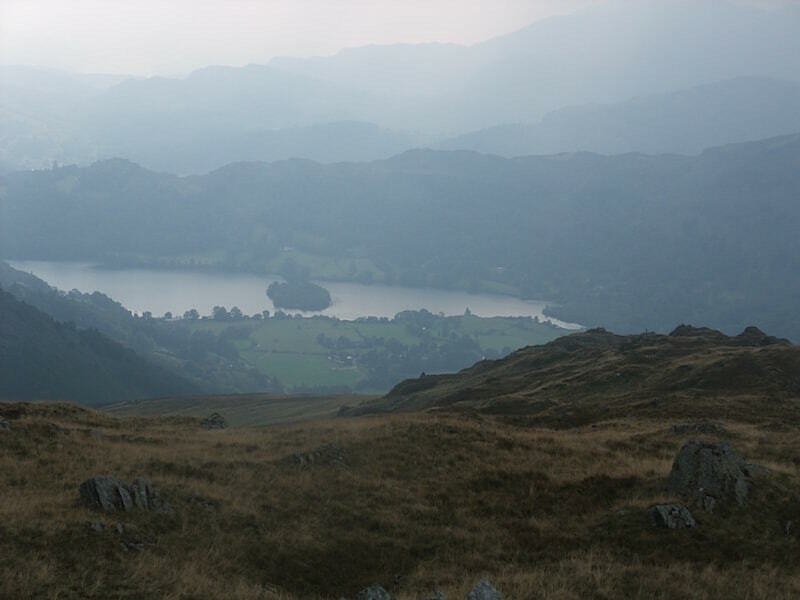 Grasmere in the gloom and there is still the strange pink glow. 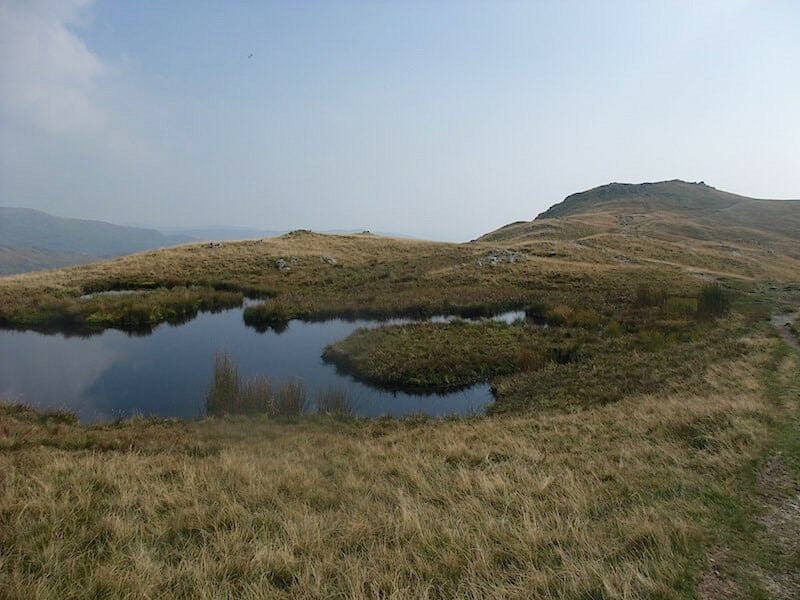 A close up of Alcock Tarn. Looking back at Stone Arthur as we begin the descent. 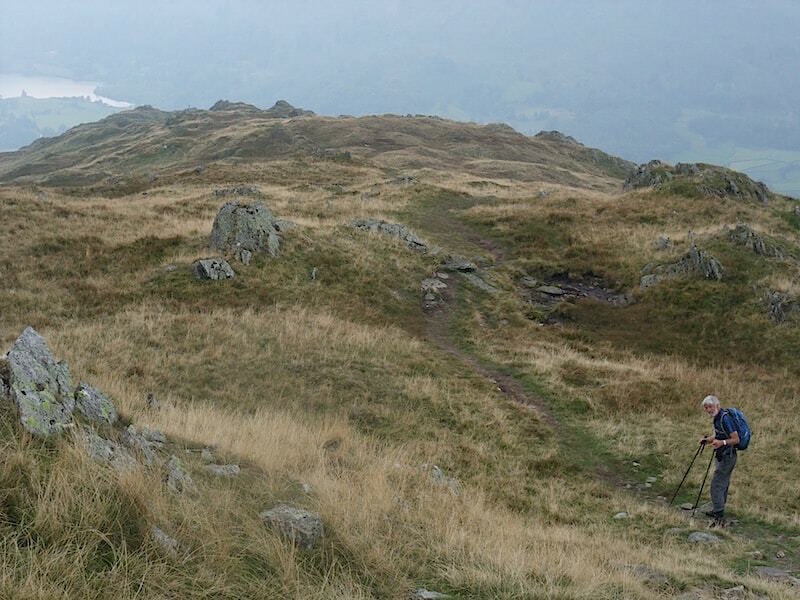 The path to Alcock Tarn which we used at the start of the walk, with the Thirlmere aqueduct below it. 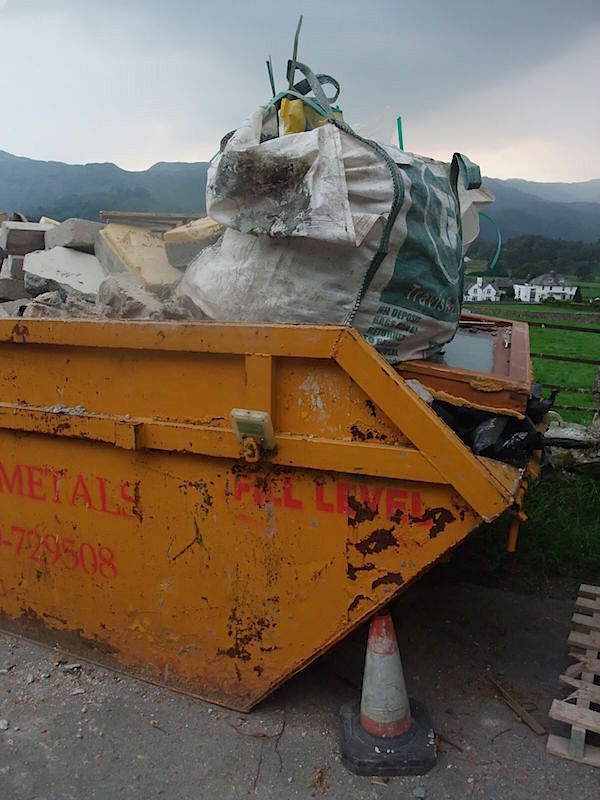 Back on the lane we came across this skip close to a house where some building work was taking place. Take a look at the wording in red capital letters just above the traffic cone. FILL LEVEL? 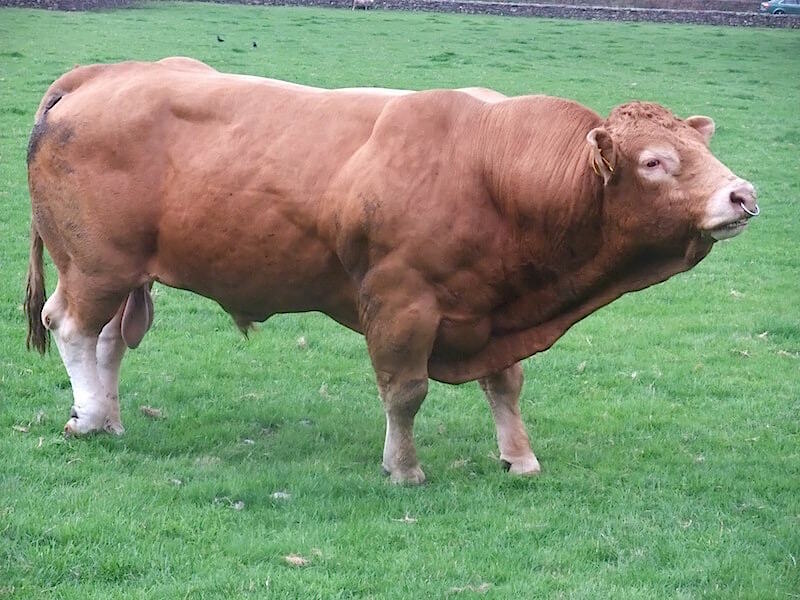 Nah, just chuck it on. 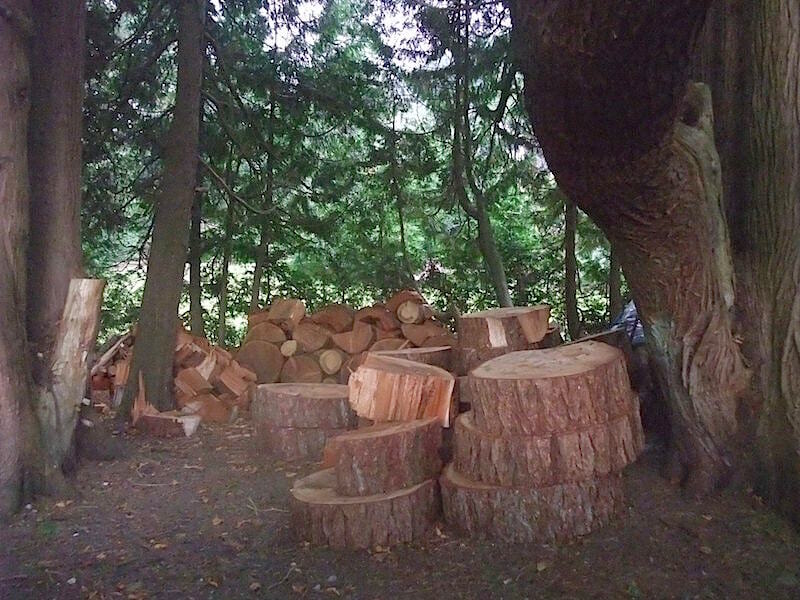 The scent of newly sawn wood came drifting along and a peep over a garden wall revealed this store of logs. Someone is getting ready for winter perhaps. 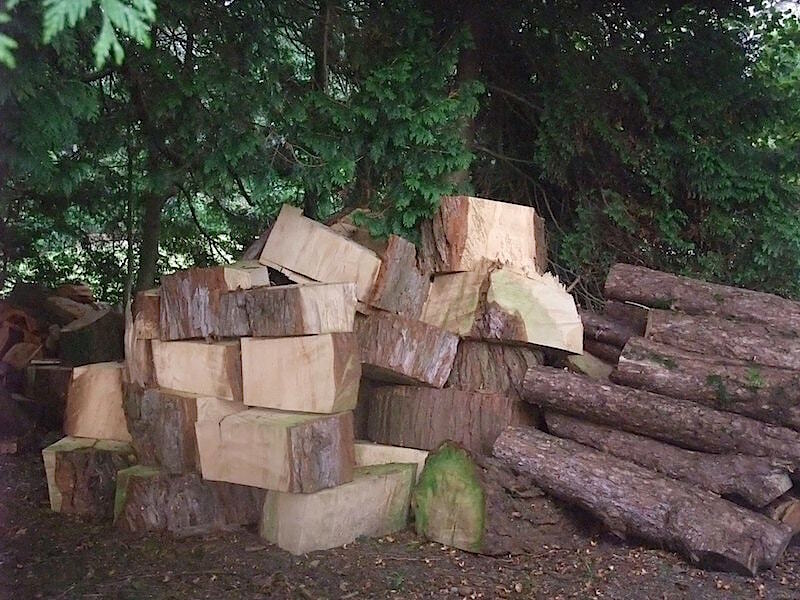 Another pile of logs stacked elsewhere in the same garden. Finally, I just couldn’t ignore this fine chap especially as he seemed happy to pose for the camera.